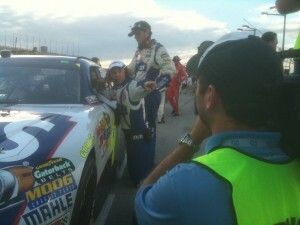 Working with TNT Is Dynamite… Atlanta and Los Angeles Directors of Photography Light It up on NASCAR. 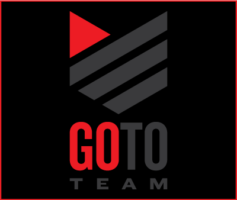 Go To Team Elite Camera Crew & Video Production Crew | Working with TNT Is Dynamite… Atlanta and Los Angeles Directors of Photography Light It up on NASCAR. 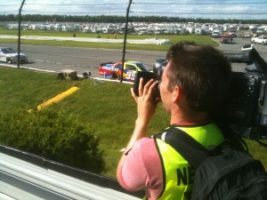 Go To Team’s Los Angeles Director of Photography, Skip Clark, once again wrapped up another explosive season with TNT’s Summer Season of NASCAR. TNT’s season is short but sweet. In just six weeks, GTT hits many unique tracks including Pocono’s triangular track, Sonoma’s road course, and Daytona’s night race. For GTT, the biggest news of the season came when fellow Atlanta Director of Photography Tom Wells stepped in for Skip at the Pocono and Daytona races. Tom felt right at home, having worked with FOX during their half of the NASCAR season. Pocono was a busy weekend to say the least. Tom shot everything from driver interviews to garage B-Roll to the celebration in victory lane with winner, Denny Hamlin. Tom even found time to grab an epic shot of Richard “The King” Petty. Speaking of Petty, Skip and Tom both shot a few episodes of Kyle Petty’s Ponytail Express. Skip found himself at the Rock ‘N’ Roll Hall of Fame in Cleveland where Kyle got a tour of the museum. That was followed by fishing in San Francisco Bay where Kyle was joined by bud, Rutledge Wood. Tom captured Kyle Petty doing a little skydiving in Daytona and exploring our nation’s capitol. Another highlight of the season was the “ride along.” Jeff Burton took Lindsay Czarniak of TNT for a ride around the New Hampshire Motor Speedway, giving her inside tips about getting around the track. Skip capitalized on this moment. He strapped a few POV cameras to the car, including an “Ice Cube” camera on the dashboard. During this moment, apprentice Roger Woodruff had the ride of his life. Roger hid in the vehicle’s backseat and attempted to monitor audio while riding at speeds reaching 100mph. When TNT’s Summer Season came to an end, it also marked the end of the NASCAR season for Skip (back to Los Angeles), his apprentice, and Go To Team. Don’t worry Skip, there’s always next year! Let the countdown begin!